IInnovation in the mobile and technology arena has seen an emerging trend in the use of open data through “citizen developers” making applications on both mobile and desktop platforms that makes life simpler and easier. William Colglazier is making international headlines with his new mobile application @meonthemove that makes use of open data, to highlight events across Africa, Europe and America to the world around them. 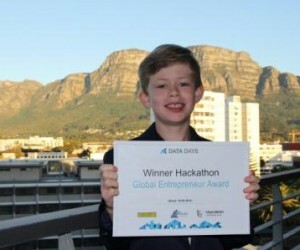 After recently winning a Global Entrepreneur Award for his app that tells people what is hot and happening in their area, William – who together with his eight-year-old friend Alex Glidden came up with the idea for the new app – spoke to Achiever in an exclusive interview in Constantia, Cape Town about his invention. In January this year, he moved to Constantia from a small town in southern Maine, about an hour north of Boston, United States.Today, nine-year-old William attends school at Reddam House, Constantia. 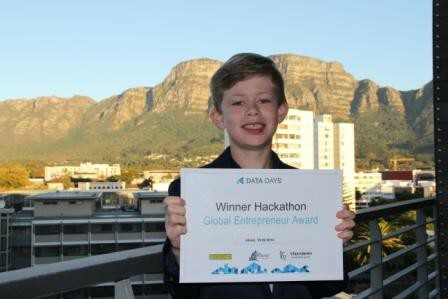 His father currently works for Standard Bank SA and his mother, Melissa Murphy, is a full-time mom. When asked about the app, William speaks confidently and fluently on topics ranging from open data to its use and function. “It basically gets open data, which is information from the government that is free (public domain), about sports events or restaurants that you can find. You can get it on your phone and you can basically go on the app and it will tell you where restaurants are to eat, or sports events you can go to, or even if there is a Halloween party. You get info from towns, cities and governments. William came up with the idea while over for dinner one evening at Glidden’s house in York, Maine, when Glidden’s mother – who advises governments on trending Smart City technologies – told them about the competition. According to him, putting the app together was the easy part and that the most challenging bit was getting the data. “A lot of people do not understand open data yet. Once they understand that it is just information like tourist events, restaurant locations or public parking lots, then they are quite interested and helpful. I teamed up with my friend, Alex; we used a template provided by the competition sponsor, Citadel on the Move. Once the data was uploaded, it only took about 10 or 15 minutes to create the app,” he says. After developing the app and presenting it at an international Open Data Conference in Ghent, Belgium, William immediately caught the attention of global businessmen and innovators, with quite a few having ‘tweeted’ about it already. The app, however, is only the first of many he would like to develop, and he says he is working on some interesting ideas at the moment. “We are still working on it, but I have a few ideas already. I would like to create a template that all my friends at school can use so they can make their own app with it,” William says. While his mother, Melissa, tells us she is well aware of the concerns there are about having children spend too much time in front of the PC, she says her approach has been to let him go ahead and engage with the computer. “I would rather see him enjoy the benefits derived from the critical thinking developed through designing and coding his own games,” she says. William has already attended summer school at Stanford University in the US, where he took a video game design and coding course for kids. “There are many video game design summer courses at Stanford, just for kids. Two summers in a row, he went to Stanford. When asked about what he was doing at summer school, William highlights Multimedia Fusion Developer as one of the programs he learnt to use. It is a drop-and-drag style software for developing video games. “So you can get a character from the Internet or from the Multimedia Fusion droplist. You can also get blocks and you can use the block to code it into something. If you had a character and you could code it to say if you touch that button, it will go right or it will go up,” he explains.Being a PC boffin is only one of William’s fortes. Sports and physical activities are a big part of his life and have seen him partaking in karate, rugby, kickboxing as well as water polo. Besides his team sports at school, he trains at the Athlete Development Centre in Tokai. William has travelled quite extensively, having visited 15 countries already. “I have lived in the US and England. My favourite places visited were probably Greece and Rome. Egypt was pretty good, too. I also went to Norway and that was fun. I’m an excellent skier,” he says. Making money is an important aspiration for young William, but he has managed to balance that with a sense of giving. Both he and Glidden have decided to give all their prize money to a charitable cause and will donate it to the Emmanuel Educare Centre in his area.“My school also does Blisters for Bread and that is all about donations. I give money to the kids because I have had a pretty good life and I just want to give back to someone else,” he says.